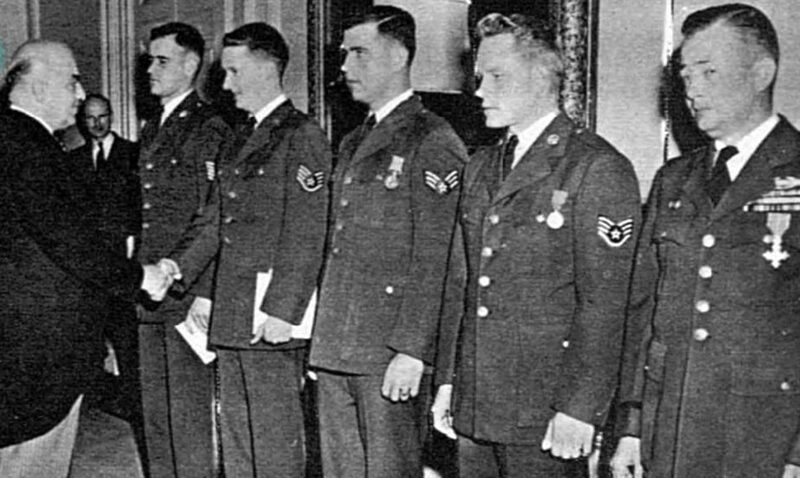 There were numerous acts of gallantry recorded over the period and British awards were made to civilians and military personal, including honorary awards to men of the United States Air Force stationed in East Anglia. These and the meritorious service awards that followed the rescue effort were spread over several editions of the London Gazette, including the Coronation Honours list; the honorary awards were not published. There were more British awards made in the aftermath of this disaster than for any other single, non-warlike event in British history. Ninety-five gallantry awards were made in connection with the floods (not including honorary awards). The bulk of such awards to civilians were published, with citations, in an edition of the London Gazetted dated 28 April 1953. The list comprised 71 awards—three MBE (Civil Division), three George Medals, 17 British Empire Medals (Civil Division), 47 Queen’s Commendations for Brave Conduct, and one Queen’s Commendations for Valuable Service in the Air. In addition, an edition of the London Gazette dated 6 October 1953 recorded the awards, with citations, related to the sinking of m.v. Princess Victoria—a posthumous George Cross to the ship’s radio officer, four MBE (Civil Division) to ship’s captains who responded to the distress call, and two British Empire Medals (Civil Division) to Royal National Lifeboat Institution coxswains who also responded. The final awards were published in the London Gazette dated 17 November 1953—three British Empire Medals (Civil Division) to men who disposed of volatile explosives from a flooded factory on Bramble Island. This TA Officer on his own initiative reported for flood duty with his Regiment on 1st February and spent 32 hours in the Mablethorpe and Trusthorpe flood areas working continuously without sleep and with little food from Sunday morning 1st February until the evening of the following day. It is estimated that he was personally responsible for the evacuation of approximately 140 civilians. On one occasion, he pushed a collapsible boat (which he himself took to Trusthorpe), full of evacuees, half a mile to shallower water, loaded them on his gun tractor and carried them to safety. 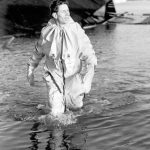 On other occasions, he walked one mile through high flooded water for additional vehicles to evacuate civilians stranded in isolated farms. He also salvaged two civilian buses, filled them with evacuees and towed them to dry land. His determination and resource under most trying conditions were an inspiration to all who saw him and especially to the man under his command. On 31st January, 1953 a call was received from King’s Lynn for two 3 tonners for rescue work. Although there was no request for an Officer, Lieutenant Jones detailed himself to go out in charge of the two vehicles. The Lieutenant and his staff evacuated all invalid and aged persons from Diamond Street, King’s Lynn, where there had been deaths from drowning and the flood water was still high. In spite of a strong wind, extreme cold, approximately 3 ft. to 4 ft. of flood water underfoot, under-water obstacles and slime presenting unseen hazards, the Lieutenant and his squad did magnificent work. Lieutenant Jones himself went back again and again into houses where rescue work was very difficult and he rescued a number of persons whom he carried down difficult staircases and through deep water in the lower storey rooms. He set an example to civilians and others. Lieutenant Jones did not spare himself until the evacuation was completed and he himself was nearing the point of absolute exhaustion. When HM Dockyard, Sheerness was flooded on the night of 1st February, 1953, a ship in dry dock was in danger of capsizing owing to the. flood waters pouring into her engine room. Petty Officer Horlick organised a party of five ratings and, securing a dinghy which was drifting nearby, boarded the ship. The party had already seen another ship capsize but, in spite of this, and fully aware of the risk they ran, Petty Officer Horlick led the party below by the aid of candle lanterns. He found where the water was flooding into the engine room and, working for nearly an hour in semi-darkness, the party succeeded in making the ship reasonably watertight. Petty Officer Horlick set a splendid example of courage and leadership and showed outstanding initiative and knowledge of what to do to ensure the safety of one of HM ships. Displayed initiative, courage and resource during the flooding at Landguard Point on the night of 31st January/1st February 1953. Sergeant Eastman was awakened about midnight owing to the gale and flooding. Hearing cries coming from ‘B’ Block, Married Soldiers Quarters, he immediately proceeded in the dark, through three to four feet of turbulent and debris covered water to assist a soldier, his wife and two young children to get clear of their flooded quarter. He carried two young children back to his own quarter. Then hearing cries from ‘C’ Block he again set out and made his way to the quarter occupied by a sergeant and family. On arriving at the quarter he considered that that the prospect of getting the family back through the flood water to the higher ground was not practicable. He therefore remained with them for two hours until the water had somewhat subsided, and then assisted the family to ‘A’ Block, Married Soldiers Quarters. The quarter in ‘B’ Block was badly flooded and he and his family had to be assisted clear of the quarter and flood water. On reaching ‘A’ Block with his family he heard cries coming from the direction of the railings around the RAF Experimental Establishment, he thereupon proceeded through the flood water and saw a Corporal and his wife standing on a small wall, clinging to the railings. Knowing that a ditch was between him and the wall he found a plank and positioned it so that the Corporal and his wife could walk across it into water that was only two to three feet deep. Bombardier Turpie then heard cries coming from the railings and once more set out and found a woman and baby clinging to the railings. He carried her and the baby through the flood water which was turbulent and rat infested and with much debits floating about. Bombardier Turpie acted with courage and determination. A Royal Signals Corporal at Canvey Island. Is this Corporal Stephenson? The United States 3rd Air Force provided significant materiel and personnel to assist in dealing with the floods and several men acted most gallantry during the rescue efforts. In addition, seventeen Americans, military and civilian, were killed and a little under 70 families lost all their possessions. The award of the George Medal to Airman 2nd Class Reis L. Leming was authorised on 20 February 1953 and presented on 15 April by the Home Secretary, Sir David Maxwell Fyfe. The remaining awards were authorised on 2 July 1953 and presented on 1 September 1953, again by Sir David Maxwell Fyfe. Major Parkinson [sic] received a telephone call informing him that the sea had gone over the wall in Hunstanton and that people living along the beach were in danger. He went to Hunstanton where he found the South Beach flooded and people on rooftops unable to get to safety. Major Parkinson immediately took command of the situation. He called the Royal Air Force Station, Sculthorpe, for rescue personnel, equipment and vehicles which could be used for rescue operations. Major Parkinson supervised the clearing of the road of civilian vehicles that had been flooded and were unable to be removed under their own power. The road was cleared to enable the rescue boats to be launched upon their arrival. In addition to disaster activities at Hunstanton, he organised and supervised rescue operations both at Heacham and Holme flood areas. Through his efforts the rescue activities were organised and co-ordinated so that the maximum use of equipment and personnel were possible. Many persons were rescued from the flood waters as a result of his initiative in taking charge of the overall situation. Major Parkinson directed the entire operation continuously from 7.00 pm on the 31st of January until he was relieved at 7.00 pm on Sunday the 1st of February. On the evening of 31st January, 1953 Staff Sergeant Freeman A. Kilpatrick knowing that flood tides and winds above 85 knots were threatening to engulf the area of his house in Hunstanton, without regard for his own safety ventured out into the storm for the purpose of warning other families, both American and English, of the impending disaster. He placed his family on the second floor of his home then swimming in the raging water and debris, he rescued eighteen persons. He then swam back to his home to evacuate his wife, child and two English people to the roof of his home where they remained until the following morning when rescued. Through his efforts, other families were able to escape while he and his family were forced to suffer the worst of the storm during the night. On the beach at Hunstanton Airman 3rd [sic] Class Reis Leming saved over 27 people from the flood. 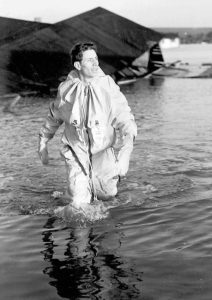 He was wearing an American exposure suit and, swimming with a rubber dingy in tow, he picked up these people who had been isolated by the floods. After the third trip he, himself, collapsed because of exhaustion. Airman Smith with complete disregard for his own personal safety and well-being, voluntarily displayed heroism above and beyond the call of duty. He was a rescue crew member of an amphibious track laying vehicle which was sunk by two large waves. He was stranded soaking wet on a rooftop himself for two hours. Later Airman Smith in helping to evacuate survivors, heard another airman calling for help and he plunged into the water and dragged the man, who had fainted, and the seven survivors on the life raft twenty yards to safety. Using a raft himself, he located three other survivors. Airman Smith continued searching for survivors in the icy waters for two hours until his Commanding Officer ordered him to rest. After resting an hour, Airman Smith again volunteered to go out in the flood waters to launch a stranded airborne life boat stuck on the railway track. 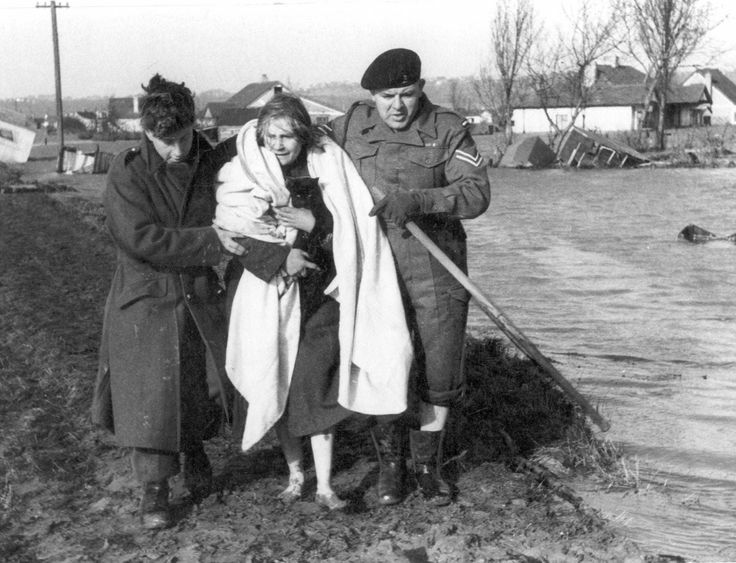 For rescuing persons trapped by the floods at Heacham, Norfolk, on the 31st of January, 1953. Sir David Maxwell Fyfe congratulating the men during the ceremony at the Home Office on 1 September 1953. 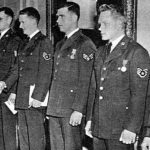 The men are, from left to right—Technical Sergeant John J. Germaine, of Big Hollow, Deposit, New York, and Airman First Class Jimmy Brown, of Chattanooga, Tennessee, both of whom were awarded the Queen’s Commendation for Brave Conduct; Airman First Class Jake J. Smith, of Memphis. Tennessee, British Empire Medal; Staff Sergeant Freeman A. Kilpatrick, of Opelika, Alabama, George Medal; and Major Julian E. Perkinson, of Norfolk, Virginia, Honorary Member of the Order of the British Empire. 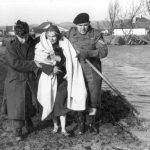 Civilian meritorious service awards relating to the floods were published as part of the Coronation Honours list in the London Gazette on 1 June 1953. All these awards are described as, ‘For services during the recent floods in the Eastern Counties.’ They comprised three CBE (Civil Division), 16 OBE (Civil Division), 28 MBE (Civil Division), and 90 British Empire Medals (Civil Division). Although the appointment or role of the recipients was recorded, there were no accompanying citations. The meritorious awards to British Army and Royal Air Force personnel were published in a separate edition of the London Gazette dated 1 June 1953, also without citations, and comprised three OBE (Military Division), five MBE (Military Division), two British Empire Medals (Military Division) and one Queen’s Commendation for Valuable Service in the Air. There were no Royal Navy awards specifically for service during the floods. 2. (Back) For details of the support provided and for the citations for honorary awards see: TNA. PRO. (1953). 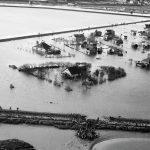 Royal Air Force: Rescue Services (Code B, 67/33): Assistance to civil ministries: East Coast and Netherlands floods, 1953. AIR 2/11955. 3. (Back) Leming was also awarded the Soldier’s Medal, the broadly equivalent United States Army and Air Force award (the Airman’s Medal was not established until 1960). In August 1953, Leming went to the rescue of two holiday makers whose boat capsized off the beach at Hunstanton. 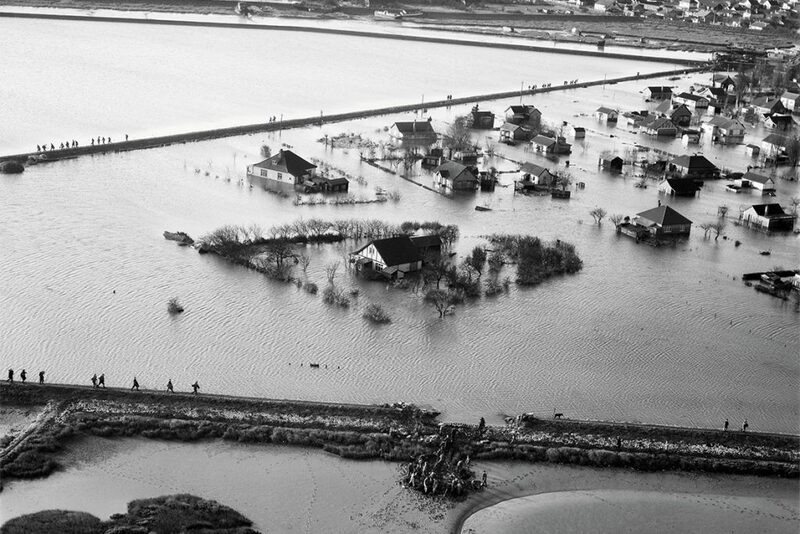 Looking through the photographs of the East Coast floods in 1953, has brought back the memories of the day following. I was the RAF photographer from RAF Upwood who took the aerial photographs with a hand held F24 camera taking 5X5-inch negatives. I was standing at the rear door, open, strapped with a harness to the far side of the fuselage, of a Dakota aircraft. Upon landing, the camera was taken from me and that was the end of my mission. It was not until years later that I saw the results! I do have a few copies. Hello Keith, I’d love to see them. I have sent you an email.